Santa Monica Studios first revealed God of War’s Photo Mode last month. During the reveal, the studio showcased the mode’s abilities to change camera angles, alter the depth-of-field, and apply filters. Now that God of War’s update 1.20, Photo Mode has at last been added to the game. Santa Monica Studios shared a handful of images which the developers had taken using Photo Mode to celebrate the release. The new mode offers a surprisingly expansive selection of photographic tools. The camera menu has five tabs; aperture, borders, camera, characters, and filters. The customization options available within those five groups even go so far as to allow players to alter the facial expressions of Kratos and Atreus. Aperture: This tab offers controls to adjust the camera’s Depth of Field and Focus Distance, as well as F-Stop. Borders: This tab allows you to add Vignettes, including different styles of Borders and the God of War logo. You can also adjust the Intensity and Falloff of Vignettes. Camera: This tab allows you to adjust the camera’s Field of View, Camera Roll, and Focal Length settings. 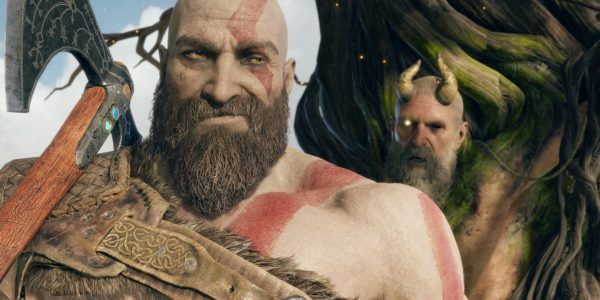 Characters: This tab allows you to change Kratos’ and Atreus’ facial expressions, as well as adjusting the visibility of individual characters in the scene. Filters: This tab lets you change Filter options, including Intensity, Exposure, and Film Grain. In-game, Photo Mode can be accessed in the Options Menu. It can also be accessed via Touch Pad Quick Access, enabled in the game’s settings. You can control the system using the thumb sticks to move the camera and the R2 and L2 buttons to pan up and down. In addition to Photo Mode, Patch 1.20 increases the text size of all of God of War’s UI and menus. It also adds in the option for players to re-map Rage mode. To coincide with the release of Photo Mode, Santa Monica Studios announced God of War emoji stickers for iOS. These stickers are available for free on the App store. While they are not currently available on Android, they will eventually come to Android devices on the PS Messages App.